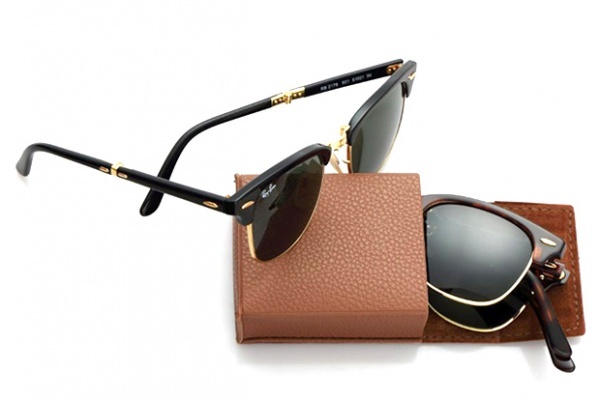 Ray-Ban‘s iconic Clubmaster sunglasses are now available in a handy folding version for those who need their frames to be a little more versatile. The Folding Clubmasters feature acetate and metal frames and is offered in a variety of finishes including tortoiseshell and black with gold-tone, silver-tone and rose gold-tone metal: all keeping with the quality and standards of the non-folding editions. The frames come with either Ray-Ban’s G-15 lenses or its gradient lenses depending on the color combination chosen, so your options are pretty varied. The Folding Clubmasters are available now from Ray-Ban. This entry was posted in Sunglasses and tagged Clubmaster, Compact, Folding, Ray Ban, Sunglasses. Bookmark the permalink.